James Allison, assistant professor of Industrial and Enterprise Systems Engineering (ISE) at the University of Illinois, has been named the recipient of the Design Automation Young Investigator Award from the American Society of Mechanical Engineers (ASME). Allison is the first recipient ever to earn this award with just two years experience as a faculty member. Considered the most prestigious honor for junior faculty in the design automation research community, the award recognizes an outstanding young investigator who is making noteworthy contributions in the area of design automation, including research in design representation, design optimization, design evaluation, and/or design integration. In a short time, Allison has established himself as a respected educator by University of Illinois students. In his first year on campus, he was one of a handful of professors to earn the Engineering Council Award for Excellence in Advising and was nominated for the Illinois Student Senate Teaching Excellence Award. A leading voice in design optimization, he has been widely published on the subject. Allison has been at the forefront of improvements to the ISE undergraduate curriculum. He and a few of his graduate students developed tabletop trebuchet kits using SimMechanics software for last fall’s 100-level general engineering course. The kits were assembled specifically so that there were design decisions to be made, and the students were assigned to make modifications using MATLAB software in an effort to maximize the range of the projectile. 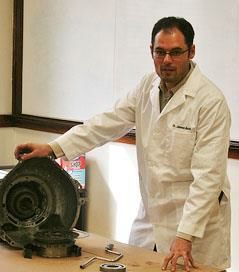 Allison used his expertise in the automotive field to present a college-wide demonstration on a transmission disassembly. During the 2013 fall semester, he will continue his innovative hands-on approach during the GE 410 class where he will ask students to build one-fourth of an automotive test bed. Allison holds MSE degrees in both mechanical engineering (2004) and industrial operations engineering (2005) and a PhD in mechanical engineering (2008) from the University of Michigan. He got his start in the automotive industry earning an AAS degree in automotive technology from Weber State University while working his way up to management at a car dealership then went back to school for engineering, earning a BS degree in mechanical engineering from the University of Utah in 2003. Prior to joining the Illinois faculty in 2011, Allison was a lecturer at Tufts University in the Department of Mechanical Engineering, a senior engineer at MathWorks, Inc., in dynamic system modeling and design, and an employee of the Ford Motor Company in the area of engine design optimization. Allison will be formally recognized in August at the ASME International Design Engineering Technical Conference (IDETC) in Portland, Ore. If you have any questions about the College of Engineering, or other story ideas, contact Mike Koon, writer/editor, Engineering Communications Office, University of Illinois at Urbana-Champaign, 217/244-1256.